Final Duty - The Alien War Anthology, my second book has been on the Amazon.com Kindle Science Fiction anthology bestseller list for the last two days. The top 100 books on any Amazon bestseller list are updated hourly and yesterday morning I saw Final Duty enter at the number 93 spot. After that I watched the book climbed all day until it reached the number 50 spot. I was thrilled to see my book on the anthology bestseller list, and hoped it would keep up that slow climb all the way to the number one spot. That hasn’t happened yet. 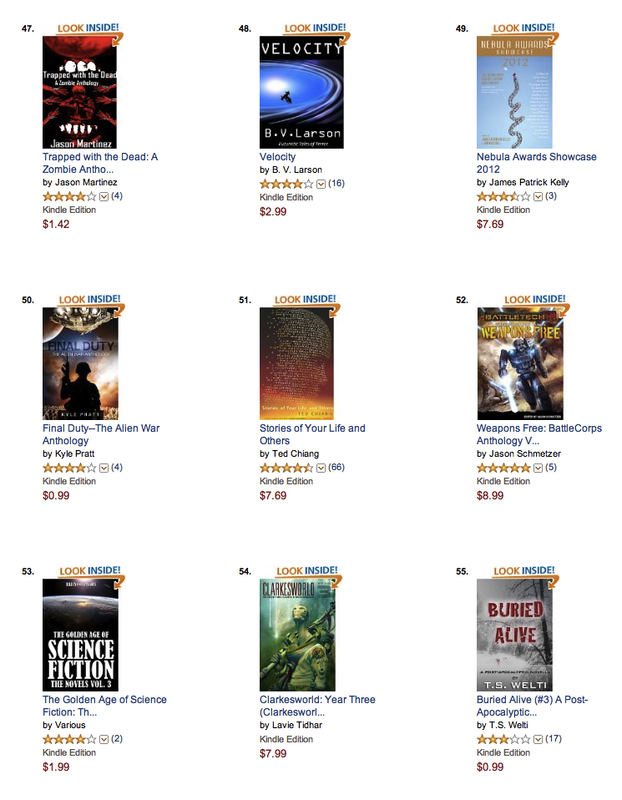 Since reaching the number 50 spot Final Duty has been bouncing around the lower half of the science fiction top 100. The book title comes from the novella that opens the collection. The title story is set twenty years after the death of Lieutenant Amy Palmer’s father. Aboard the reconnaissance ship Mirage, she has returned to the Altair star system where her father died. Almost immediately disaster strikes and Amy, along with the crew of the Mirage, must face the possibility of performing their final duties. Final Duty is a novella set in the same universe as the other two stories in this anthology. I can’t be disappointed with a book that is doing well and I’m hopeful it will resume its climb. I’ll be watching and if Final Duty does enter the top half of the bestseller list I’ll let you know.